This is a very small restaurant located in the Place Dauphine, which serves traditional French cuisine with Basque country specialities, and has a cosy atmosphere with a traditional warm feel and an outside terrace. 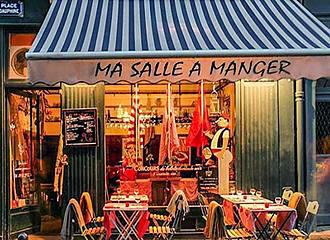 The Ma Salle a Manger is a traditional restaurant located within a very historical square in Paris known as the Place Dauphine, yet its full name is Square de la Place Dauphine, and you will find this square and restaurant on the Ile de la Cite island by the Palais de Justice. 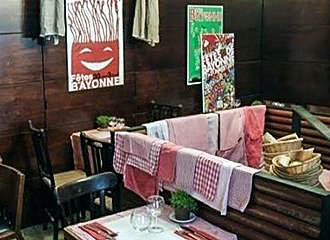 Now this small restaurant in Paris was fully restored in the 1990s and can only accommodate approximately 20 people at a sitting in the air-conditioned dining room, which has a warm cosy feel with a Basque style decor and lots of red checkered tablecloths, which you will often also find hanging over the banisters that go downstairs to the kitchen. 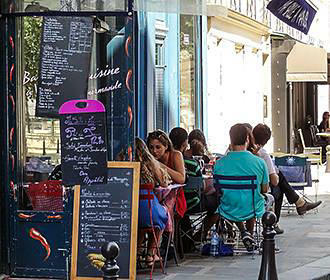 But for the nicer days, you can also enjoy eating al fresco on their terrace by the cobbled street, which is actually heated in winter by large patio lamps, and then you can also do some people watching or maybe just enjoy a summers evening. But do not expect to just hear French, you may also hear Spanish being spoken by staff, especially at a weekend and some do speak English as well. The cuisine at Ma Salle a Manger is traditional French food with an emphasis on Basque country and classic Southwestern cuisine, yet the menu changes during the seasons depending upon what produce is available, and there are always numerous items including the dishes of the day written on blackboards outside. Yet some of the delights on offer may be Duck Confit with potato gratin, Beef Bourguignon, soups, snails, Foie Gras, cassoulet, turbot, and many others to delight the taste buds that are served in hearty portions in a friendly welcoming atmosphere, which means locals come back time and time again. The lunch and dinner formula menus at Ma Salle a Manger will not break the bank either, as a main course of a lunch time is only around €15 as of 2014 and €18 in the evening for dinner. But you could opt for a three course lunch at only €24.50, or a three course dinner at only €27.50 as of 2014 and enjoy rounding off your meal with a delicious Basque cake for instance. You will find this restaurant in Paris is open daily for lunch and of an evening for dinner where they are still serving at 10pm. Yet because it is such a small restaurant, and very popular with hearty cuisine at a reasonable cost, it is recommended to make a reservation prior, even though it is not necessary. However, we would like to point out that the Ma Salle a Manger is only open by appointment during the months of January and February along with a Sunday evening all year round, so a prior reservation is necessary during these times. Now getting to this restaurant is very easy, as it is located right by the Pont Neuf Bridge on the Ile de la Cite island, close to the entrance to the Place Dauphine, and when it comes to public transport, the nearest Metro station is the Pont Neuf stop on line 7, or alternatively, you have the Cite stop via line 4, however, if you are travelling on the RER trains, you would need the Saint-Michel - Notre Dame stop or the Batobus water bus also stops reasonably close by.